OK so here I am again, this either takes a long time to arrive or I'm doing it wrong, I have added a New Mail and switched from Auoresponder to Notification and nothing. I have a Contact Form, Enquiry Form and Job App that I have done and only the very first time did a contact form go through, so I don;t understand why they others aren't coming through or the same confact form again. I need to get this, right so Ican sign, so Ineed help. This is taking far too long. really it is. I'd appreciate it. Can you supply me with the form url and assure that you typed you email with no spaces. Also did you do all of this:? 5. To find out what email address used for submission notifications click "Reply-To and Recipient Settings" button. 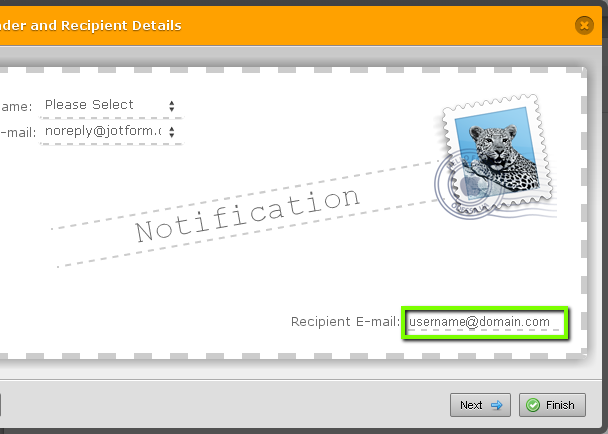 A step by step Tutorial on Finding out E-mail Address used for submission notifications can also be found here. Sorry for the inconvenience, can you please update us on how it's going with your email notification so we can assist you with your problem? We will wait for your response.